Please join us for a big happy Spanish Fiesta Wednesday night and share your big dreams for the New Year! On this evening members will be offered free flow Sangria, tapas, and clay-brick oven pizza! 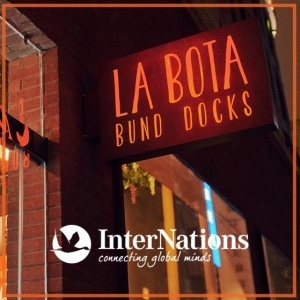 LA BOTA Bund Docks is that big happy Spanish restaurant we all love offering great Spanish wine, tapas, and big paellasssss'! Olé! Located across the street from Table No. 1. Also, we are doing something special: we'd lie to ask that all of you please write your plans for CNY and your biggest goal for the New Year in the comments section below. It will be great to see the different vacation plans and goals from all of us! Remember, this event is on Wednesday night due to CNY. Make sure to bring plenty of business cards and be ready to meet alot of great people! Olé! We look forward to see you there!